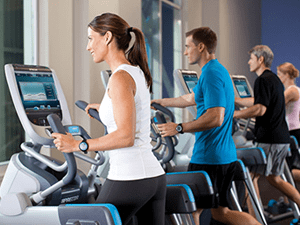 The Gym at Gang Warily Recreation Centre has 34 stations of the latest Precor equipment. The cardiovascular and strength range gives users an opportunity to work towards their fitness goals in a safe, controlled environment. We have fully qualified instructors who are on hand to help you get the most from your workout by offering advice and support. There is also an area dedicated to free weights for those who want the freedom to work out away from the machines. The GW Fitness suite has been awarded the IFI (Inclusive Fitness Initiative) stage 2 award, giving fitness opportunities for both the able-bodied and disabled user. The equipment is very user friendly; we have work stations with touch screen monitors and optional music throughout the gym. Our Cardio stations have the latest in gym technology; you can surf the web, watch your favourite shows or log into your fitness log.